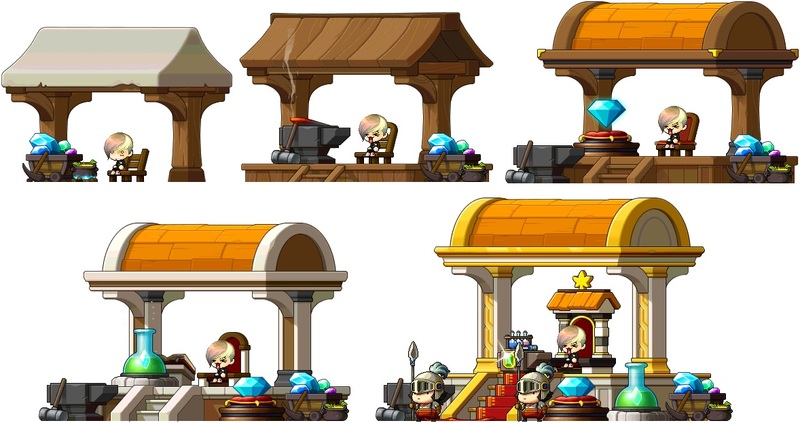 [Updated] Cash Shop Update for January 24 | Dexless, Maplestory Guides and More! Discussion in 'Maple Updates' started by Nexon, Jan 25, 2018. Have some quiet time to contemplate with the Spring Flower Chair, Heart Cloud Chair, Beautiful Music Chair, and Cherry Blossoms Chair. If multiple players sit near in each other in the Cherry Blossoms Chair, an effect will appear. Take a ride with the Lovely Scooter Mount, Romantic Bike Mount, Pink Bean Balloon Mount, Spring Breeze Mount, and Together with Angel Mount. These mounts are available as permanent versions. On January 27-28, we will be having a special deal on Scissors of Karma and Platinum Scissors of Karma! You can use these items to make certain untradeable equipment tradeable one time. You have until 11:59 PM PST on January 28 (2:59 AM EST / 8:59 AM CET / 6:59 PM AEDT on January 29) to purchase these items at a discount. Make sure to move them from your cash inventory to your item inventory and use them soon! On January 27-28, we will be having a special deal on Fusion Anvils and Medal Fusion Anvils! Some of the possible prizes you can win include the The Ring of Torment Coupon (which gives a ring that reduces the player's damage dealt by 30% while granting a 15% base EXP increase), Lucid's Earrings Coupon (which gives earrings that allow you to frighten your enemies with nightmares, stunning 15 enemies for 9 seconds, not affected by some binds), Maple Swingboat Chair, Magnificent Lucid Soul, the Firestarter Ring Coupon (which gives a ring that grants a skill that can be activated to increase the Burning stage level of the current field), White Cubes, Violet Cubes, Frenzy Totem, Permanent Pendant Slot Expansion Coupon, Permanent Hyper Teleport Rock Coupon (tradeable), a BattleRoid Coupon, Seasonal Surprise Style Boxes, Maple Points Coupons (including 1 Million Maple Points), and more! Don’t forget, you get THREE prizes for every spin, but your only chance to win is during the event period starting January 19--- so spin away! January 17 to January 30 in the Special Promotions > New Arrivals category in both Reboot and non-Reboot worlds. Each Heroes Surprise Style Box holds a random permanent equip themed for one of the Heroes of Maple! There are 36 different permanent items available, themed for Evan, Aran, Phantom, Mercedes, Luminous, and Shade. In non-Reboot worlds, you can trade these style box items with other players through the Cash Item Trade window, if you haven’t equipped them. Right-click on a character to see the menu. January 17 to January 30 in the Special Promotions > Limited Time category in both Reboot and non-Reboot worlds. Get a special new look themed for the Heroes of Maple! This is your chance to look like one of the six heroes of Maple World. Take your Heroes Royal Hair Coupon to NPC Big Headward in Henesys Hair Salon, or your Heroes Royal Face Coupon to NPC Nurse Pretty in Henesys Plastic Surgery to get your new style! You can preview the styles by double-clicking on the coupon in the Cash Shop. Check out the Male Hairstyles available now: Elf King Hair, Polearm Warrior Hair, Phantom Hair, Glossy Flyaway Hair, Dragon Master Hair, and Forgotten Hero Hair. Check out the Female Hairstyles available now: Elf Queen Hair, Polearm Warrior Hair, Phantom Hair, Glossy Flyaway Hair, Dragon Master Hair, and Forgotten Hero Hair. Check out the Male Face Styles available now: Elf King Face, Polearm Warrior Face, Phantom Face, Heterochromia Face, Dragon Master Face, and Forgotten Hero Face. Check out the Female Face Styles available now: Elf Queen Face, Polearm Warrior Face, Phantom Face, Heterochromia Face, Dragon Master Face, and Forgotten Hero Face. Dress up like an adorable penguin with these permanent outfits! These cozy outfits will keep you warm and toasty! January 22 to January 28 in the Special Promotions > Limited Time category in non-Reboot Worlds only. Celebrate Australia Day! Take home this adorable bouncy kangaroo pet, who thinks he's the toughest guy this side of the outback. He comes with an equip to wear, yummy pet food to eat, a Pet Name Tag, and some useful pet skills and scrolls. January 22 to January 28 in the Special Promotions > Limited Time category in both Reboot and non-Reboot worlds. We <3 Australia! Show that you do too with these permanent items. January 22 to January 28 in the Special Promotions > Limited Time category in Reboot world only. Celebrate your love for Australia by taking home an adorable bouncy kangaroo pet! Let it join you on your adventures in Reboot World!